Now you can use OCR (Optical Character Recognition) feature online at Google Docs. Upload any image or PDF file to extract text from them using OCR option on Google Docs. 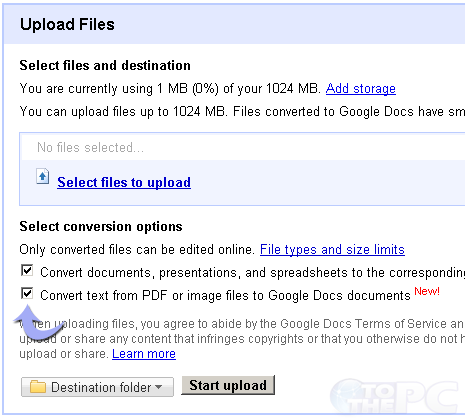 It allows you to convert and save text on images and PDF files as Google Documents for quick text only content editing. 1. Goto docs.google.com & login into your Google account. 2. Click “Upload” button at top left. 3. Use “Select files to upload” option to select files for uploading. 4. After selection, click to check “Convert text from PDF or image files to Google Docs documents” option under “Select conversion options”. 5. Click “Start Upload” for online OCR conversion. Google Docs will extract text from select image or PDF file and save it as Google Docs text document. Besides Google Docs, there are many dedicated online tools for OCR conversion. You can try New OCR and Free OCR tools for quick image to text conversion.